Evening: Every Monday, Tuesday & Wednesday. Address: 128 Hartington Road, Stockwell, London, SW8 2HJ. Summery: A fabulous interactive comedy show, held in our vintage style ballroom, featuring new and established acts competing to be the best of the night! Gemma Beagley & David Armitage host, with a set from Tam the Pub Organist in the pub room before the show. A fabulous interactive comedy show, held in our vintage style ballroom, featuring new and established acts competing to be the best of the night! Tam the Pub Organist will be performing from 7pm - 7.45pm! Free Entry & Every welcome! 15 booked acts perform 5mins each plus 5 open spots for sign up on the night. Beautiful vintage seated venue, fully compered show, email in advance to book seats! Hosted by David Armitage & Gemma Beagley with Shirley-Jane & Tom Taylor on Sound. Best event in London for your First Show or to try out new material. Food available, including the infamous Disco Fries. If you are wanting to perform. 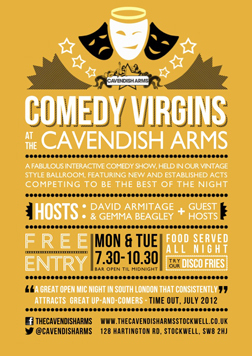 please visit the Cavendish Arms website and sign up to our Comedy Virgins mailing list. Average wait for a spot is 5 weeks. 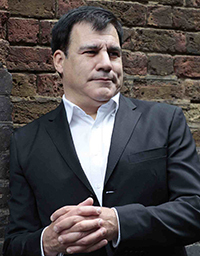 Fast-talking, award-winning New York comic Lewis Schaffer breaks the mould with his one-of-a-kind free show every Tuesday and Wednesday. "Lewis Schaffer has a unique style," says Time Out New York. "He can insult you and love you in the same sentence." Some comics try to push boundaries but Lewis Schaffer pulls the rug out from under you, and himself. The New York Post raved: "Lewis Schaffer makes fun of others at his own expense. Well worth catching." Come and see why Free until Famous is the longest-running solo comedy show in London. It's funny and it's free - until he's famous. A collection will be made at the end of the show. Give only if you've laughed. Recommended by The Times, The Guardian, The Independent, Time Out, London Evening Standard, The Scotsman, londonisfunny.com, spoonfed.co.uk, londonist.com, visitlondon.com, londontown.com and many others. A Malcolm Hardee Award Winner. "Schaffer undeniably has funny bones." "I would pay to see Lewis Schaffer." COMEDY SLAPPERS! (FREE) New & Established Comics take to the stage. Check Facebook for listings. Hosted by comics Jo Lacey, Paul Langton & Mark Jeary! BAR OPEN TILL 12AM! We have a free comedy night twice weekly in our underground Vault Bar called Touching Cloth from We Are Funny Project. Comedians try out their new material and have to option to 'touch the cloth' if it hasn't gone well, at which point the audience explodes in clapping regardless of whether it was funny or not. Hosted by the hilarious Alfie, it's a great night, the doors open at 7pm and the shows start at 8pm.